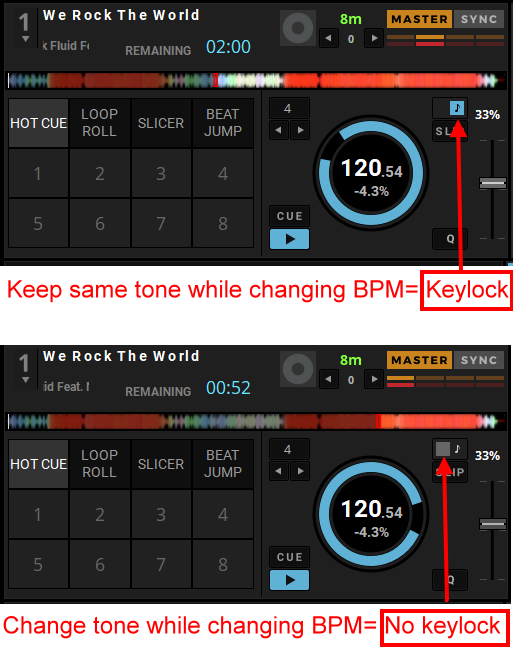 I just downloaded the new djuced 4.0.5 and i have a question, if i want to raise the song's bpm and as a result the pitch is raising, how can I save the pitch from a certain raised point? the problem is that everytime i change the bpm the pitch is going up and down with the bpm, and i want it to be constant. for example, if i have a song 120 bpm, i raise it to 125 bpm and changing the pitch, and i want to *keep* that pitch and to go back to the original tempo of the song. I saw that there were only two buttons of saving the original pitch and the other is to change the pitch. is tht possible? because in the previous version (djuced 40) that I had it was possible-there was a "lock" button next to the pitchfader, which i don'e see now.. please help if you can :) Thanks! I think the keylock button is still in Djuced 4.0.5: please confirm if you mean the function described hereafter. I don’t think this is what I meant. ill try to explain it one more time- I want to change the tone (pitch) of the song to a higher or lower tone than the original tone while I change the bpm, and to keep it the same tone while I change the bpm again. The button you showed me it’s the keep the original tone while changing the bpm. I mean to change the bpm and the tone of the song to a specific tone and from there to keep that tone and to change the bpm again, as was possible in the earlier version..
if you know what I’m talking about i am happy! Thanks for the help!! Indeed on a former djuced version, the keylock was applied from the current tone instead of being set from the original tone. Djuced team was asked to set a keylock at the original tone, so the way to change the tone has changed. I have an additional question-if i want to set a cue of my own, (not on the bass line if you know what I mean-between the lines) I mean to set a cue in any point of the song that I want, how am I doing it? 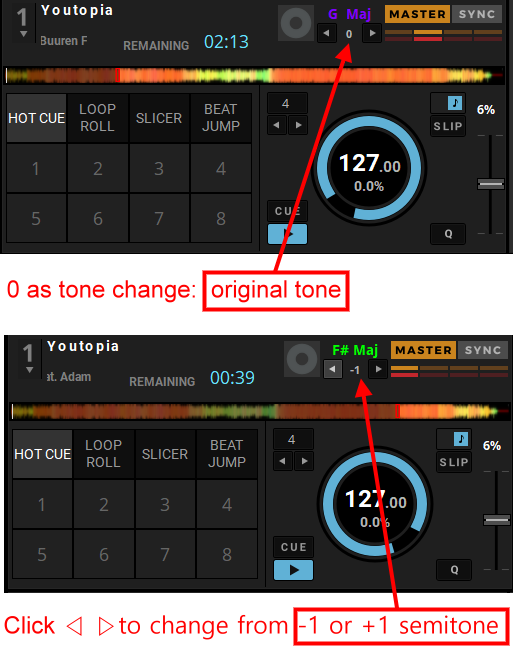 because when I click on set cue it always puts it in the bass or in a begining.. I hope you understand because it's hard to explain it :) Thanks!!! 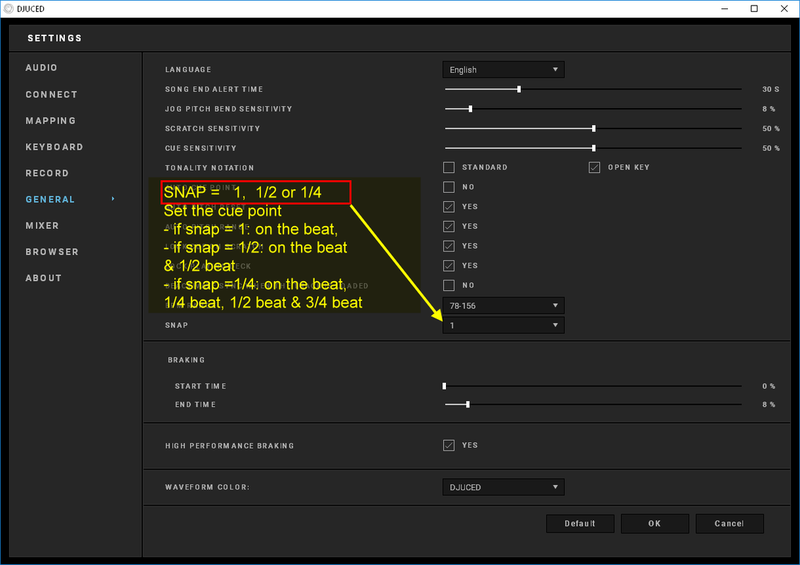 If any cue point you try to place is set on a beatgrid bar instead of being set at the cursor position when you pressed on Hot Cue, then it means the Snap mode is enabled, with value 1. 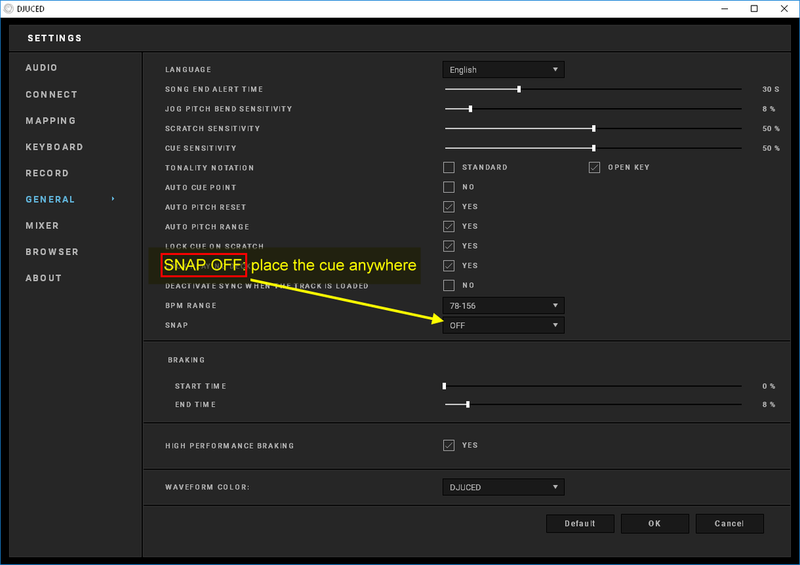 To place the cue point and hot cue points wherever you want, you must switch off the snap mode.